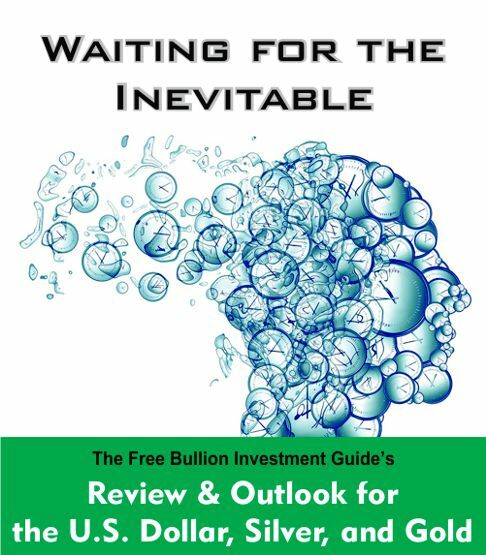 Thank you for visiting the Free-Bullion-Investment-Guide's latest blog post, before we get to the precious metals review and outlook, below are some of the Best Bullion Market-Related News articles that were taken from this guide's home page, over the past few weeks. A Rebound in the U.S. Dollar. 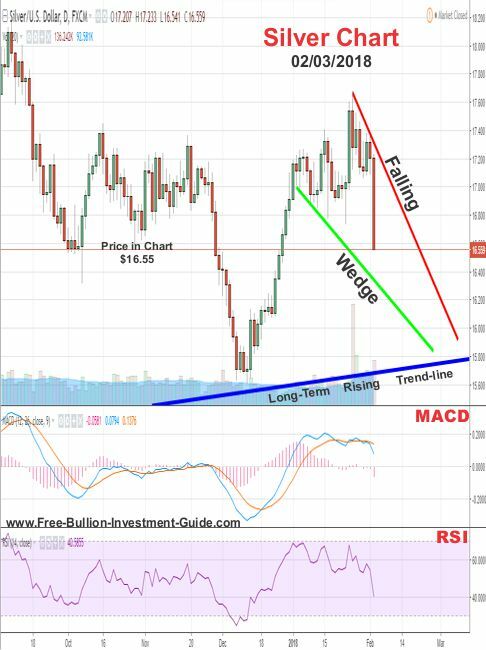 Four weeks ago, on January 7th, I published the following blog post: A Rebound in the Dollar will cause Silver and Gold to Dip, in that blog post I wrote that a positive wedge pattern had formed in the dollar's charts and that a rebound would happen. That news crushed the dollar and its short rebound looked exactly like a dead cat bounce. Hence, the name of the next blog post, that was published two weeks ago on January 21st, titled: The Dollar's Dead Cat Bounce. In the blog post, I wrote that even though the dollar had fallen after the news about China possibly halting its purchases of U.S. Treasuries, a positive pattern was still in the dollar's charts and a rebound is still expected. 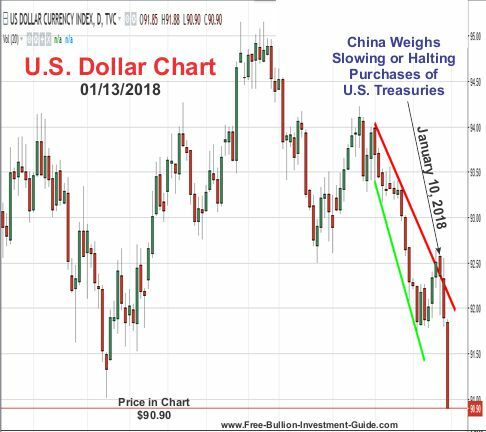 Then on January 24th, the U.S. Treasury Secretary Steve Mnuchin stated that a 'Weak Dollar is Good for the U.S," and as the title of the article below says the U.S. Dollar tanked after the U.S. Treasury Secretary made his remarks. But, the same positive wedge pattern is still sitting in the Dollar's charts below, and that is why I'm 'Waiting for the Inevitable." This U.S. Dollar Review will be a little longer than normal because I am going to add to this review the charts and commentaries from the last two blog posts. 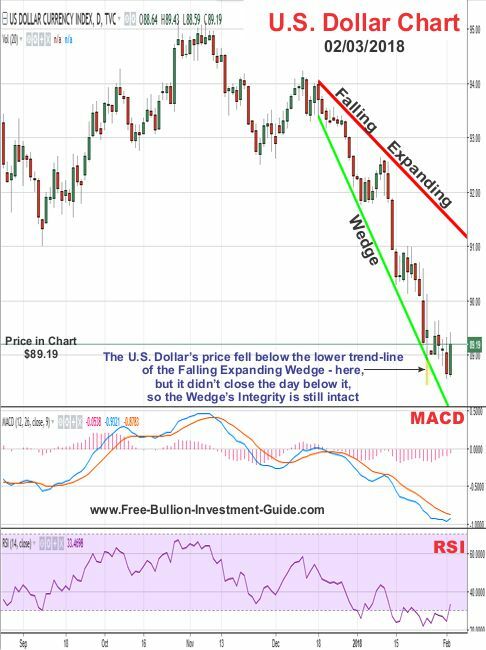 In the outlook chart below, you can see that the Dollar has formed a narrow 'Falling Expanding Wedge' pattern. It is a positive pattern, but because of how narrow it is, it's hard to say how positive it will be for the dollar's future, quite honestly it could end up looking a lot like a 'dead cat bounce,' but its too early to say how the dollar will rebound after its latest fall. 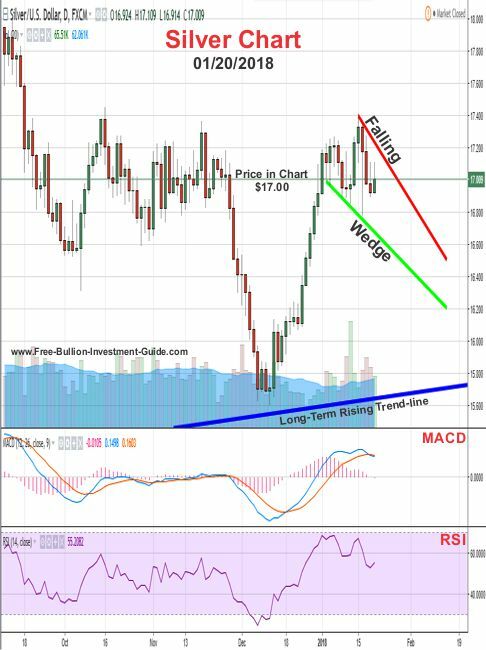 Lastly, you'll notice in the dollar's MACD chart below, I've traced the bar chart with a 'black line,' this is a clear indication that a rebound should happen in the dollar's price soon. Plus, the RSI, below the MACD, has already started to show that a rebound is due to happen to the dollar. In the chart below, you can see that the U.S. dollar briefly bounce up and confirmed the narrow 'Falling Expanding Wedge' pattern. However, after the Bloomberg article mentioned in the intro was released, the dollar ended up tumbling down like a dead cat. In the U.S. Dollar's outlook chart below, I adjusted the upper trend-line of the positive 'Falling Expanding Wedge' pattern. Even though the pattern was confirmed two weeks ago, it's still the most prevalent technical pattern that can be found in the U.S. Dollar's chart, so because of this, some sort of rebound in the dollar is still expected. 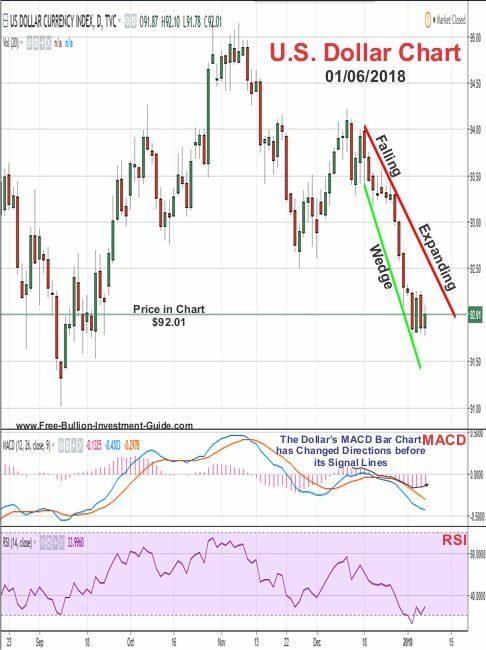 In addition, before the Bloomberg article was released more of a rebound in the dollar was expected prior to its 'dead cat bounce', but now it is trading low in oversold territory as its MACD and RSI indicate. So, at the very least, the U.S. dollar is expected to break above the new upper trend-line of the 'Falling Expanding Wedge' sometime in the next week or two. As you can see in the chart below, the U.S. Dollar is still trading inside the positive 'Falling Expanding Wedge' after it dropped in price from the U.S. Treasury secretary's comments were made. It was that comment that made the price of the dollar fall below the bottom trend-line of the wedge pattern, but the price did not close the day below it and it is because of this the integrity of the wedge is still intact. The dollar is still expected to rebound, it's been beaten down and is trading deep in oversold territory, so a rebound is still expected. To be honest, I'll be surprised if it rebounds above the upper trend-line of the 'Falling Expanding Wedge' (as it should) simply because of the damage that has been done to the dollar's technical support levels. However, the pattern is still the most dominant pattern in the U.S. Dollar's chart, so until a new pattern appears a rebound in the dollar's price is still expected. 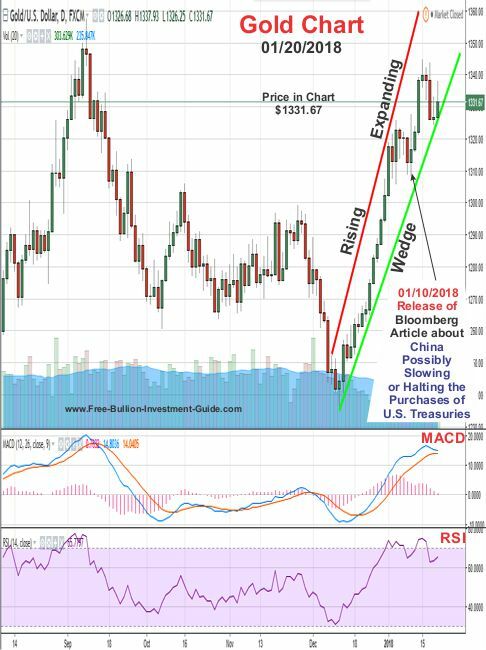 Two weeks ago, I wrote the outlook for silver and posted the chart below. 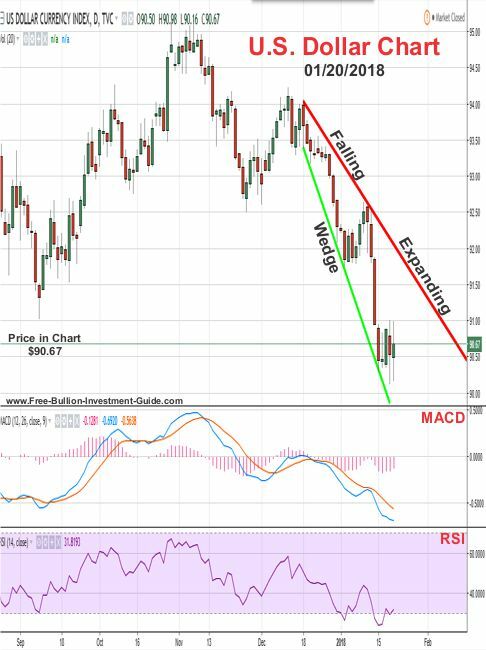 In Silver's outlook chart below, it has formed a positive 'Falling Wedge' pattern. 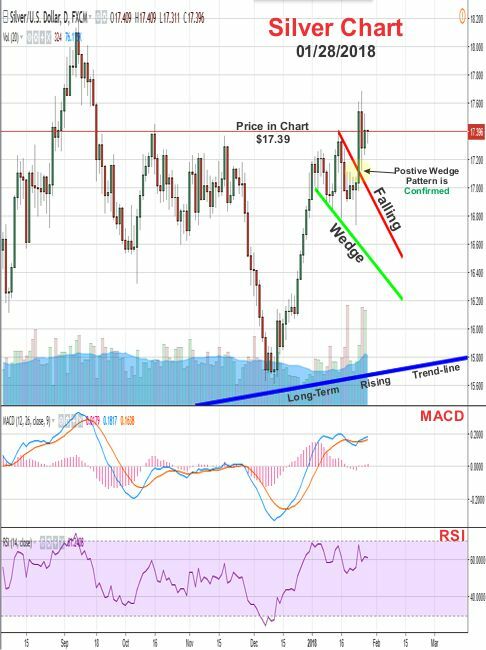 The pattern has just formed and the MACD and RSI are both giving the indication that the price of silver may continue to consolidate inside of the wedge before it moves out of it. Plus, the U.S. Congress is currently dealing with the shutdown of the government, so until 60 senators can agree on a funding bill, we may see silver flirt with the upper trend-line sooner rather than later, ultimately time will tell. The chart below is from last week, I use Tradingview.com's charts and to my knowledge, you can't pull-up post dated charts from their website, so even though I didn't post any charts last week, I did do a little chart work before I posted the latest Gold Nanoparticle Cancer Research News blog release. Anyways, the chart below is from last week, and as you can see the price of silver broke above its falling wedge, confirming it. This happened the same day as the U.S. Treasury Secretary made his remarks about liking a weak dollar. 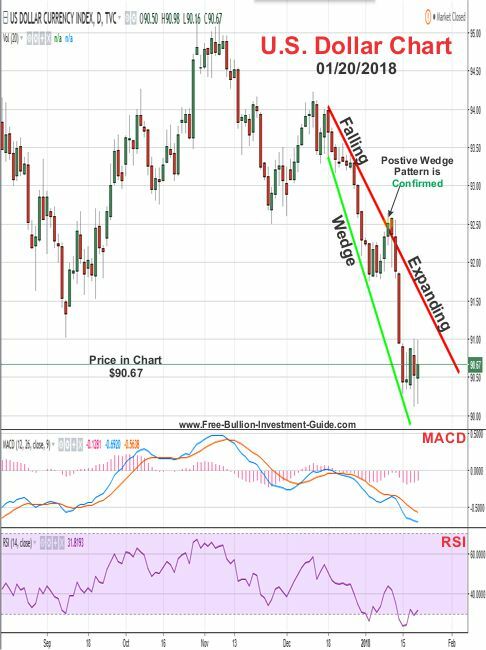 In silver's outlook chart below, you can see that a new and larger 'Falling Wedge' has formed in its price chart. This is a positive pattern, but because of the broadness of the wedge, the price of silver is expected to trade inside it before it breaks above the upper trend-line. The question now is: When will it break the upper trend-line of the positive wedge? That I can't tell you, time will tell. Below, is what was written in the gold outlook from two weeks ago and its corresponding gold chart is below it. Unlike silver, gold still has not broken below its negative 'Rising Expanding Wedge' pattern, which may have something to do with what's happening concerning the funding of the U.S. government. So the price of gold may move higher as traders move into it because it is a safe haven. However, sometime in the near future, gold should follow silver and confirm its negative 'Rising Expanding Wedge' technical pattern. 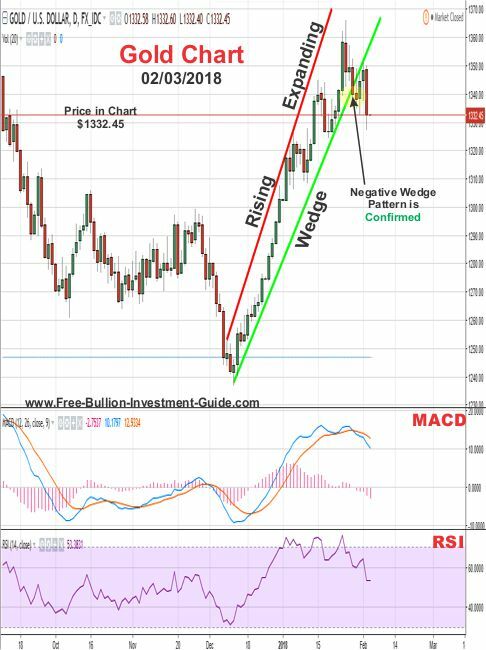 As the chart below indicates, the price of gold confirmed the negative 'Rising Expanding Wedge' as expected. The pattern is very broad, so gold clearly has some room to trade inside it, however it could break above it in the near future. 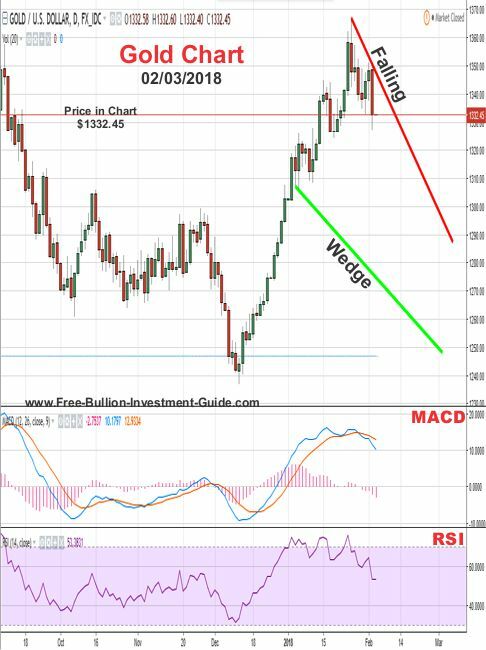 But, gold's MACD and RSI are not giving this indication, instead they are showing that the price of gold will likely pullback more in price and trade inside the wedge before it confirms it by breaking the Falling Wedge's upper trend-line.